Announcement MikesPenTurningZ where custom wooden pen making is an art that you will be able to enjoy for years. Custom Wooden Pens, Custom Fountain Pen Rollerball, Fountain and Ball Point custom wooden pens. All our our pens are hand made here in New Hampshire one wooden pen at a time. We make Custom fountain pens from Exotic Burls and Hardwoods. We strive to get the most presentation possible out of every custom wooden pen that is handmade here in my shop.. Many of my pens can be gotten as rollerball or fountain just ask and I will let you know if I can convert. I am very sorry to remove custom pens from my site. I am happy to still make them but I have had way too many custom orders that don't pan out. If you want to get a custom order please send me a conversation and we can discuss. MikesPenTurningZ where custom wooden pen making is an art that you will be able to enjoy for years. 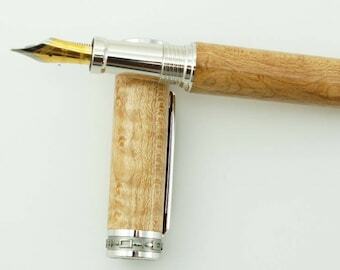 Custom Wooden Pens, Custom Fountain Pen Rollerball, Fountain and Ball Point custom wooden pens. All our our pens are hand made here in New Hampshire one wooden pen at a time. We make Custom fountain pens from Exotic Burls and Hardwoods. We strive to get the most presentation possible out of every custom wooden pen that is handmade here in my shop.. Many of my pens can be gotten as rollerball or fountain just ask and I will let you know if I can convert. I think these pens are unique and beautiful! Thanks! The craftsmanship of the pen was as beautiful as I hoped and It writes like a dream. I bought this for my wife for her graduation and she absolutely loves it, how it looks and writes. I would gladly buy from this shop again. The high quality and uniqueness of the pen is evident in every detail. Small woodshop in my basement. I like to create my pens to bring you the best that I can bring. I am working on casting, stabilization and dying so I can bring to you my unique art in the form of a writing instrument. My pens are all made using a complex multi part finishing system. All wooden pens are finished with a fifteen part or more sanding and friction finish that starts with 220 grit wet oil sanding and right up to 12000 grit wet oil sanding. My Acrylic pens are wet sanded with water to 12000 grit and polished to a mirror smooth finish. Some of my pens are finished with CA finish that makes the pen effectively encased in plastic, but most are now finished with multiple coats of a mixture of Walnut Oil, Microcrystal wax and Shellac. Then I sand those to 12000 grit and polish them. If a pen doesn't come out just so I will completely redo it. I won't put out an inferior product. I have not had anyone that has purchased from me not be satisfied with what I delivered! Thank you all for visiting my store and looking around may the Lord Jesus bless you in all ways. Welcome to our Wooden Pen Shop we turn all of our pens with Christ in mind and love every minute of it. Not all of our pens have a Christian motif but you can bet they are loved. My pens are sent out in great condition otherwise it would not be or sale. With that said this is woodworking and wood is never perfect and there is no way to change that. Please report any problems within two days of receiving your item. Please work it out with me if you have issues with your purchase I am always happy to try to work things out so you will be happy with your purchased item. I only accept paypal and direct Etsy payments. Payment is expected at the time of purchase. We ship USPS and we do our best to get right to the Post Office and make your pen arrive as quickly as we can. We live right in town so you can rest assured that your pen will be shipped at the latest on the next business day. I only want to have happy customers. Please feel free to contact me with concerns or comments we can always work things out if we try.